One of the most interesting fighter aircraft in the Luftwaffe late-war arsenal to literally burst on the scene was also the most dangerous, both to the Allied bomber crews and to the pilots who flew the diminutive rocket-powered Me-163B. 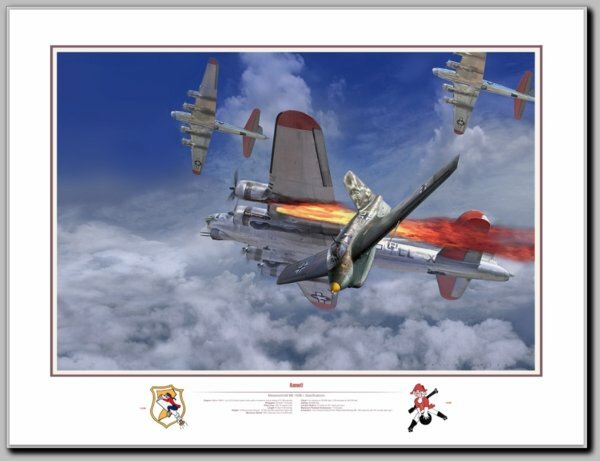 Dangerous to the bomber crews because when under attack by the “Komet” there was no effective defense, often the attack was over before anyone aboard knew what was happening. Dangerous to the pilots of this little 550 (plus) mph fighter too, given the extraordinarily sensitive nature of the two-part fuel which powered the Komet. The illustration was meant to show the attack angle which the Komet pilots learned to employ whilst attacking a Boeing Flying Fortress, where the Komet zoomed from the ground to a position well above the bombers and then rolled into a 500 mph dive, directly downwards through the bomber stream, firing its two 30mm Rheinmetall Borsig Mk.108 cannons, sufficient to bring down a B-17 in a single pass.